Happy Friday! It's been a long week which means my coffee needs are in overdrive. It's no big secret that I am a coffee addict and will have it any way I can get it - black, latte, iced, hot, you name it. My new favorite way to get my cup (ok, let's be real, my second or third cup) of coffee? Cold and creamy protein mochas. This recipe isn't earth shattering - in fact it's quite simple - but it's a game changer. For some reason, it never occurred to me to combine my love of coffee, chocolate, and protein shakes in a glass until I was rummaging in the kitchen making a chocolate protein shake. Then it hit me. I quickly added some cold coffee concentrate (make it, trust me) to my shake and the skies opened, angels sang, and it was love. Not that I'm dramatic or anything. This has been one of my go-to snacks on the weekends or days when I've got a little extra time to whip up a shake. 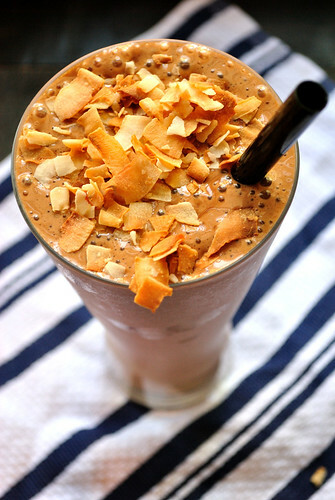 It's like a mocha milkshake or fancy drink from some national chain only way healthier. You can make it as thick or icey as you like and I highly recommend topping it with my new obsession - toasted coconut flakes. 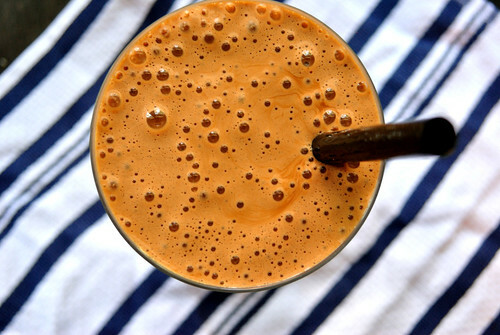 A healthy and filling way to get my caffeine fix? You don't have to ask me twice. 1. Add all ingredients, except toppings, to blender and blend to desired consistency.